The Go Getter DUAL Deluxe PA Package with Two Wireless Handheld Microphones from Anchor Audio includes the GG-8000CU2 Go Getter Portable Sound System, GG-8001 Companion Speaker, SC-50NL Companion Speaker Cable, and two WH-8000 Wireless Handheld Microphones. It also includes two SS-550 Heavy-Duty Speaker Stands to hold the speakers. The GG-8000CU2 Go Getter Portable Sound System delivers 109 dB of clear sound, features easy-to-use controls, and is suitable for both voice and background music. The portable Go Getter system features AC/DC operation and a CD/MP3 combo player that supports WMA and MP3 files, as well as CD, CD-R, CD-RW, and MP3 disks. The speaker comes with built-in Bluetooth with a range of 100' (line of sight). The built-in dual UHF wireless receivers feature 16 user-selectable channels and operate in the frequency range from 540 to 570 MHz. Each of the included 16-channel UHF WH-8000 Wireless Handheld microphones also operates in the frequency range of 540 to 570 MHz. The included GG-8001 Unpowered Companion Speaker can be paired with the GG-8000CU2 Go Getter Portable Sound System using the SC-50NL Companion Speaker Cable, which helps to reach crowds of over 1000 people. Well suited for schools, corporate training, fitness centers, houses of worship, and public speaking engagements up to 500 people, the Anchor Audio GG-8000CU2 Go Getter is a battery powered, portable PA sound system. The system utilizes a high-output horn tweeter and a 6.5" woven fiber woofer, which combine to offer a frequency response of 60 Hz to 16 kHz with an SPL of 109 dB. 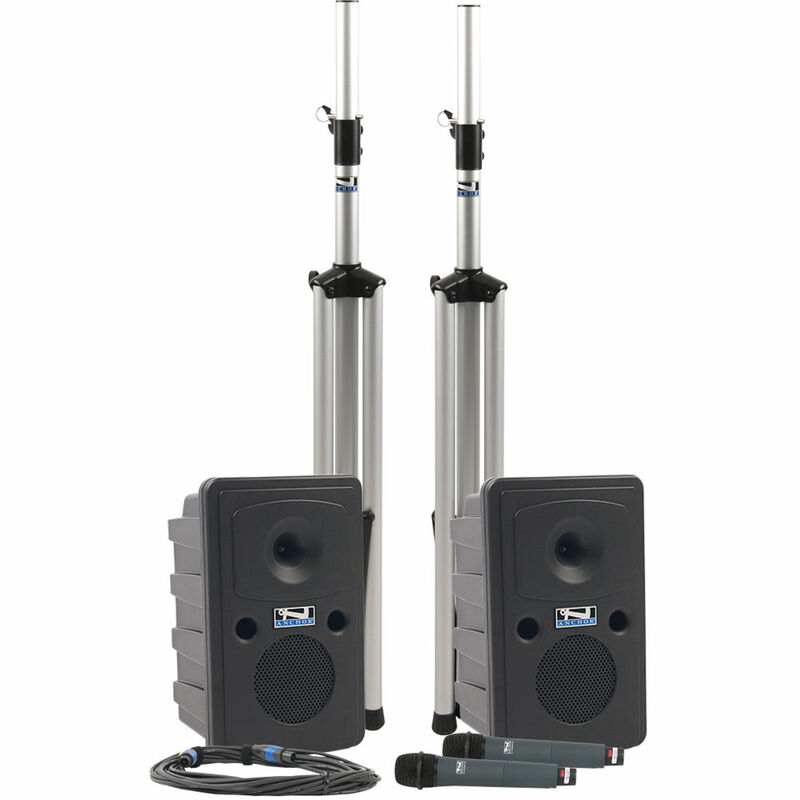 At 23 lb, it is portable and easy to set up on an optional speaker stand and can be used indoors or outdoors. The portable Go Getter system features AC/DC operation and includes an integrated rechargeable battery that can operate up to 8 hours on a full charge (at medium volume). The speaker comes with built-in Bluetooth with a range of 100' (line of sight) and a dual UHF wireless receiver with 16 user-selectable channels. It also features a CD/MP3 combo player that supports WMA and MP3 files, as well as CD, CD-R, CD-RW, and MP3 disks. The back panel features two universal microphone inputs, and an LED battery display that indicates charging and low battery. Additionally, there is a SpeakON speaker output that can power an optional Go Getter passive companion speaker. The GG-8001 Go Getter Portable Unpowered Companion Speaker from Anchor Audio delivers 109 dB of clear sound and is suitable for reinforcing both voice and background music. It is composed of a 6.5" woven fiber woofer and a high-output horn tweeter. This speaker is powered from the line out port of the Go Getter Speaker and allows reaching crowds of over 1000. The speaker is suitable for schools for playing music during activities, corporate training, and places of worship. If you have Anchor's XTREME Sound System, connect one end of the SC-50NL to the Companion Speaker Output of the XTREME. Next, patch the other end into an XTR-6001 Unpowered Companion Speaker. The SC-50NL supplies power and signal to drive the XTR-6001. The SC-50NL features high-quality 4-pole Neutrik Speakon connectors that can join satellite XTR-6001s with the XTREME Dual-Function Sound System. Join speakers up to 50.0' (15.24 m) apart using this cable. Box Dimensions (LxWxH) 23.1 x 13.4 x 13.0"
Box Dimensions (LxWxH) 23.2 x 13.1 x 12.9"
Box Dimensions (LxWxH) 14.3 x 9.7 x 2.2"